"I am home and think I must have caught a virus or something on the plane on the way home. I took the ViroGuard you sent to me before I went to Egypt (didn't get sick then! ), and used it on the plane on the way to Boston, but forgot it in my suit case on the way back from Boston! I spent the day in bed yesterday." -- Maria G ViroGuard®, formerly known as ViroShield, is an alchemical blend of botanical essences used since antiquity. 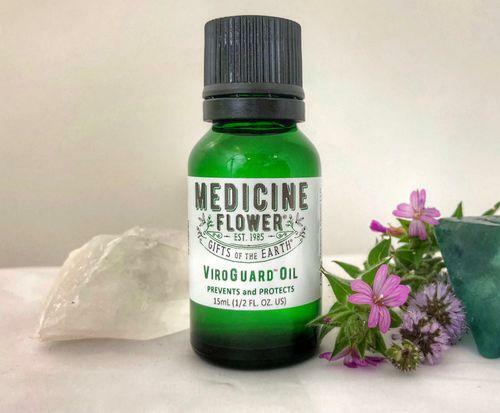 Developed according to the legend about the four thieves in 15th century England, who used these and other aromatics to protect themselves while robbing plague victims. Rub oil on the base of your palms and soles of your feet for added protection in cold and flu season. Smell or place in a diffuser as often as possible. In the near future we will have other ViroGuard products, including: ViroGuard Mist, available in a convenient travel size, and a convenient roll-on bottle.